DC hosted its first annual Curbside Cookoff, a gathering of some of DCs (many relatively new) food trucks on Thursday and Friday of last week, and I was able to take advantage of my semi-unemployment to go Friday afternoon to sample some of the different food truck offerings. Gina went on Thursday but was sad to find that by the time she got there around 6pm most of the trucks were sold out (clearly she should have skipped class to go early, I keep telling that girl to get her priorities straight). At around 3pm on Friday it was definitely busy, with lines for the more popular trucks like LobsterTruckDC about 45 minutes long. Luckily it was nice enough out that I didn’t mind waiting, and there was a really cute baby in front of me who I made faces at to keep myself entertained. 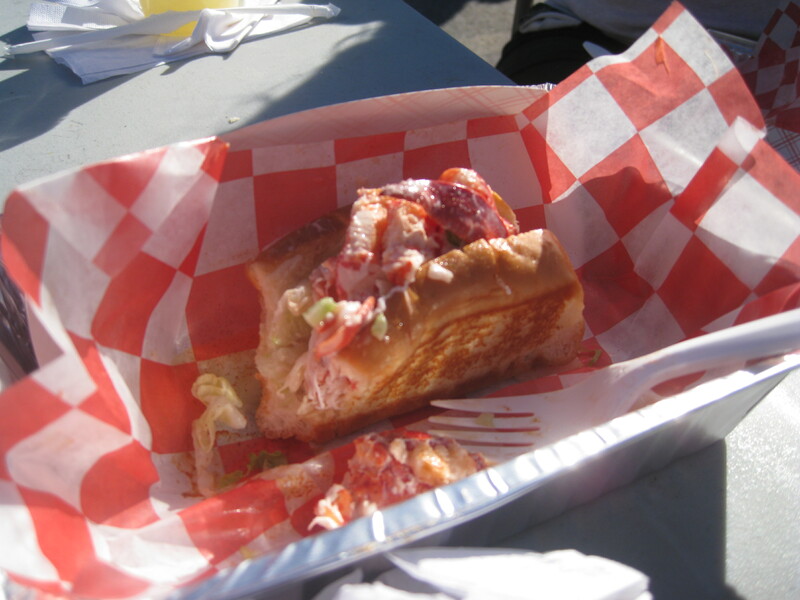 The first truck I went to was LobsterTruckDC, because I’ve been hearing about it for a while, and Gina went to the original stand at the Brooklyn Flea Market over the summer and gave it rave reviews. Waiting in line was absolutely worth it- this was some goood lobster. The only downside I would say is that the lobster rolls aren’t that big (although they do have a lot of lobster), and I could have eaten three before being full. Sadly I cannot afford three 15$ lobster rolls, so my roommate and I next got on line for TaKorean. I hadn’t heard about this one, but it had another long line so I figured it must be popular. Plus, I love anything encased in a taco shell. While waiting on line someone came over with a camera and interviewed us about food trucks and why they are so great, revolutionary, etc, which was kinda awkward but helped the time pass. I got one steak and one pork taco, and my roommate got a chicken one as well. We both agreed the pork was the best of the bunch- my steak was pretty lackluster, not helped by the napa slaw on top, which was much less tasty than the kimchi slaw on the others. I would get the pork taco again, but I wouldn’t wait 40 minutes in line for it, especially because I do not have 40 minutes to wait for lunch while at work, which is presumably when the food trucks want you to go to them. 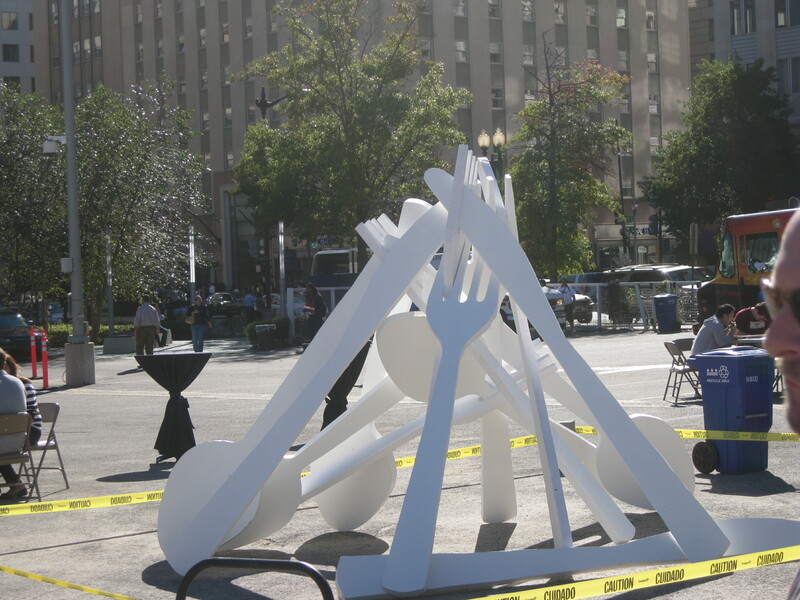 A statue of spoons and forks in the middle of the parking lot. Obviously. This was a fun event overall, even the lines were bearable since I had good company from babies and roommates. Ones I wanted to try but didn’t because they were sold out/I’m poor included Fry Captain (fries in DUCK FAT? Yes, please), DC Empanadas, and Eat Wonky. 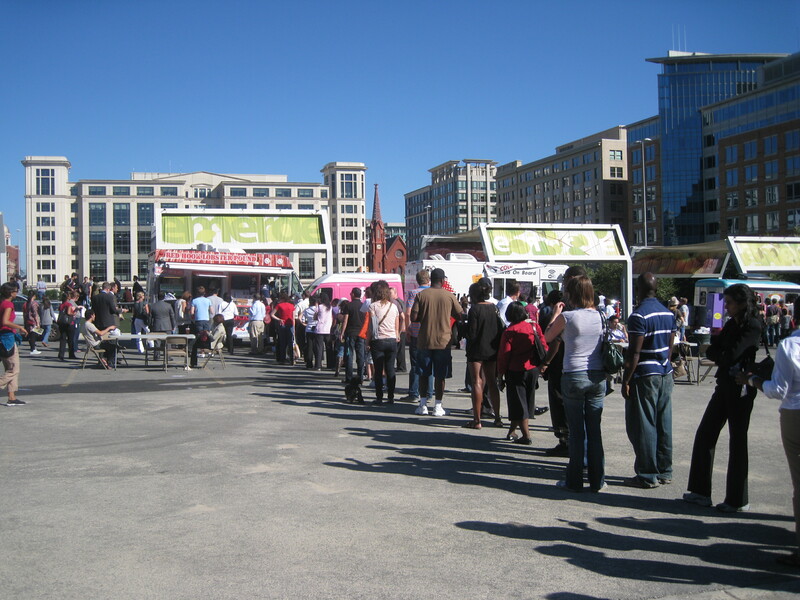 A lot of the trucks congregate at Farragut square, which is by where I work, so if I see one there in the next few days I may sample some more food-truck fare and review that as well.